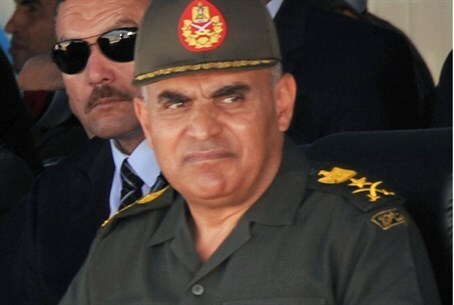 Egypt's popular army chief says he would run for president if the people demand it and the military supports him. Egypt's army chief and defense minister, Abdel Fattah al-Sisi, said he would run for president if the people demand it and the military supports him, AFP reported on Saturday, citing state media. Sisi is easily the most popular leader in Egypt after toppling Islamist president Mohammed Morsi in July, and military officers have told AFP he had support within the army to stand in the election scheduled to take place by the autumn of 2014. "If I nominate myself, there must be a popular demand, and a mandate from my army," the state newspaper Al-Ahram quoted him as saying at a meeting with Egyptian officials. The comments come just days ahead of a referendum on a new constitution, the first in a series of polls the military-installed government says will restore elected rule following Morsi's ouster. An official close to the general told AFP Sisi has not made up his mind but feels he "would not have the luxury or choice" to stand aside in the election if there is a palpable demand for him to run in the poll. Asked what evidence of public support Sisi would require, the official said turn out in the referendum to approve the new constitution would be an "indicator." Al-Ahram reported that the audience broke into applause at Sisi's comments and chanted "we are all with you". The official close to the general told AFP Sisi would be "obliged" to stand in the election if he felt the people demanded him as president. "He will never let the people down," he added, speaking on condition of anonymity. Sisi is wildly popular among a majority of Egyptians who had rallied in the millions demanding Morsi's resignation before the military overthrew and detained the Islamist leader. Most of the leading former candidates who lost to Morsi in the 2012 election have said they would stand aside if Sisi chose to run. Last week, it was reported that Sisi was expected to step down in the coming days to pave the way for his nomination in the upcoming presidential election. On Thursday, Ahmed Shafiq, who served as former President Hosni Mubarak’s last prime minister and lost to Morsi in the previous election, said he would run again - but only if Sisi does not. Morsi's followers accuse Sisi of leading a "coup" against the country's first freely elected and civilian president after only a single, but turbulent, year in office. More than 1,000 people, mostly Islamists, have been killed in street clashes, and thousands have been imprisoned, in a crackdown on Morsi's supporters following his overthrow.